Learn how simple it is to start a YouTube Channel and create YouTube videos to enhance your chapter marketing efforts. 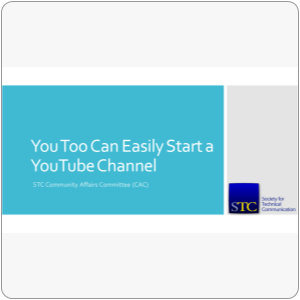 In this webinar for STC community leaders, we’ll review the steps to set up a YouTube channel and learn two simple methods to turn pictures or PowerPoint presentations into a YouTube video with music. We’ll also discuss YouTube channel features, how use cards to add interactivity to your videos, and all the ways you can share your new videos!